Sizes are 12" x 16" for a small head and shoulder, up to 20" x 24" for a larger head and shoulder, 24" by 30" to 36" by 40" for a 3/4 figure and up to 40" by 96" for a full standing figure. These sizes are approximate. Sizes can be larger. Sizes and shapes of paintings are adjusted to fit the composition (the pose) or for where it will hang. Paintings range from $1200 to $2000 for head and shoulders, $4000 to $5000 for a 3/4 figure and $7000 to $8000 for a full figure (standing or sitting) adult. Prices can double for larger portraits with complex backgrounds. Additional sitters in the painting are an additional cost. Most poses take place in the clients home or office. There are no travel costs for clients that are 1 hour driving distance from the Washington Beltway or Annapolis, or reside in southern Maryland, or are willing to be painted at Ms. Stewart's Maryland studio. Travel costs are added for work outside of this area. Paintings come framed, ready to hang. The artist is happy to advise clients on choosing larger or more ornate frames based on the painting and where it will hang. All portraits are copyrighted by the artist and all portrait images are part of Ms. Stewart's portfolio. The artist and client meet first to discuss poses, clothes and background, the size of the painting and the location of where the painting will hang. If the client is then ready to have their painting started, a 25% non-refundable deposit is required. 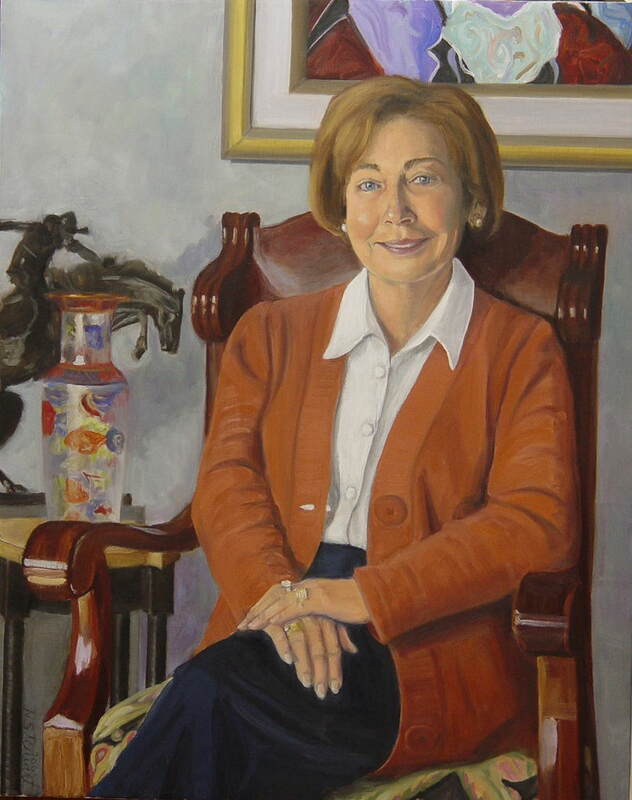 During the sittings, Ms. Stewart tries to capture the personality of the client, so discussions might include the clients hobbies and interests. This also gives Ms. Stewart a chance to watch the client to see what gestures, expressions or postures are natural. A single pose or multiple poses are selected and reference photos are taken. A color study is painted, which can take one to two hours. The color study might be done on the initial trip or on a subsequent trip. Usually clients are having a conversation with the artist while sitting for the painting, and there are many breaks. Or the client can listen to music or an audio recording of a book. One or two more sittings might be required to make adjustments to the finished painting. Because this is an oil painting, a finished painting can take anywhere from one to four months to complete depending on scheduling and complexity. 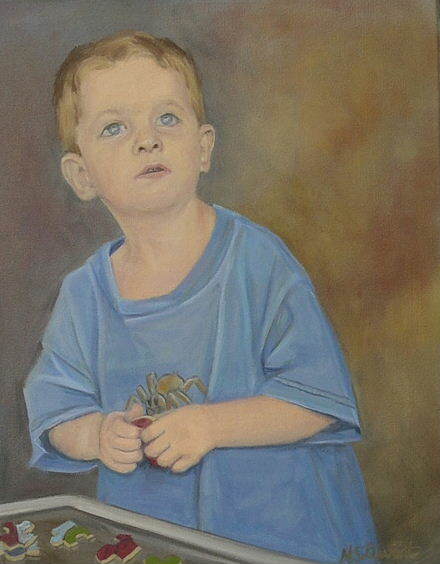 Young children are painted from photographs taken by the artist. Older children may be willing to sit for the painting and if there is room, a mirror may be set up so they can watch the painting as it happens. Because faces of babies change so much in a month, individual portraits of children are usually painted at age four or older. Children have features they will retain as adults at that age. If the child is younger, have them in a portrait with an older sibling or adult to better mark that moment in time. With the exception of Memorial paintings, all photo references are taken by the artist. All artwork on this page is under copyright. These works may not be printed, copied or used in any way without written permission from the artist.